Posted November 11th, 2017 by Daniel Hodgson & filed under Customer advice, Hodgson's. Hello all and welcome to today’s blog where you will learn important information about thatched properties and their chimneys. Firstly the biggest difference between a thatch roof and a tiled roof is that thatch is highly combustible as it is inevitably made of straw or reed and tiles are not. The chimney stack must terminate a minimum of 1.8m above the ridge line this is 1metre for a typical modern construction. 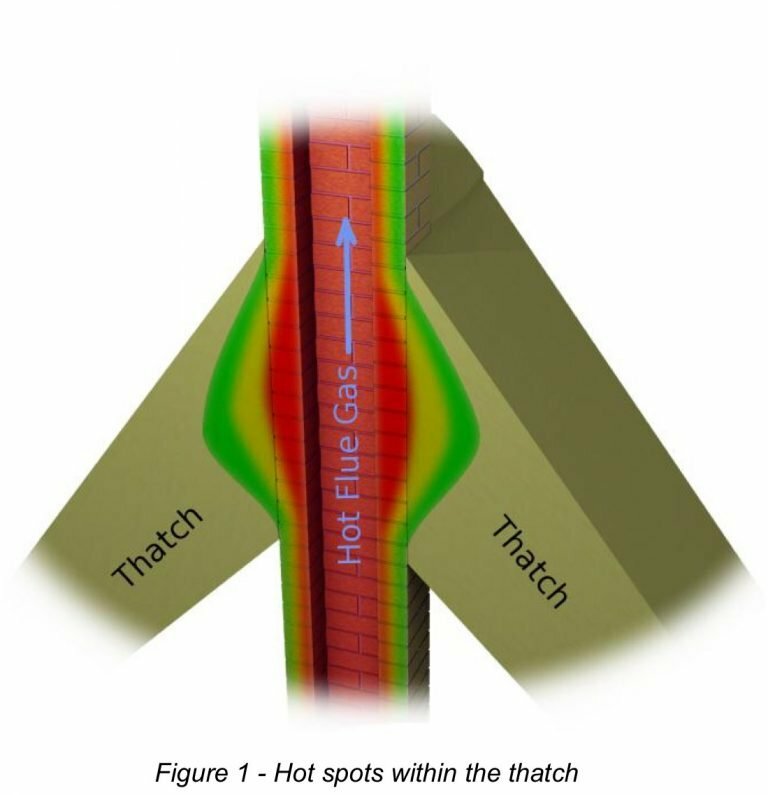 The chimney of a thatched property must be lined and insulated to prevent heat transfer. The is usually achieved using rigid insulated chimney system but there are alternative methods. There is no regulation for a brick built house only that the flue lining is solid and sound. There are many differences between thatch regulation and normal building regulations but i cannot list everything. 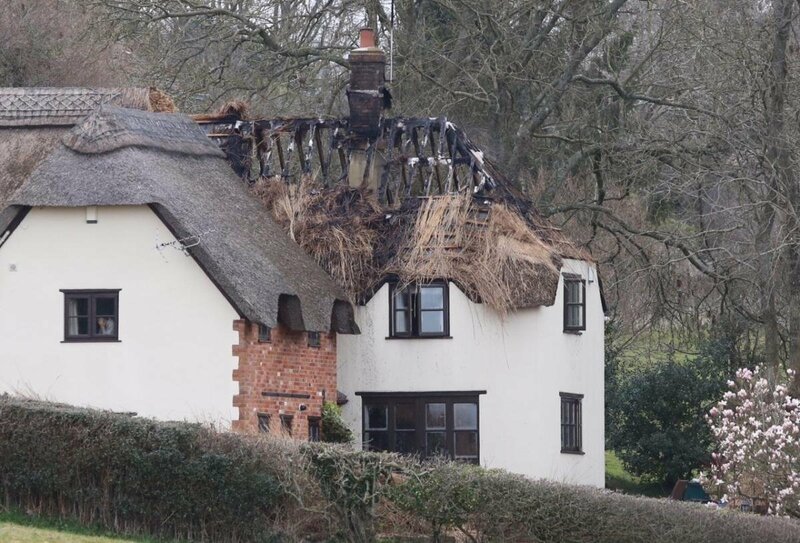 What causes chimney fires is thatched properties over and above a modern constructed brick and tiled house? There are 2 methods whereby a thatch property can become the victim of a house fire caused by the chimney. Direct and radiant heat transfer. When a chimney catches on fire the bricks and structure of the chimney get very hot inside over 1000°c. As the bricks get hot the heat begins to travel from inside to outside where the hot bricks come into contact with the thatch. As thatch is such a good insulator the heat cannot escape and eventually combusts. This problem is greatly increased in old chimneys that are damaged or in a poor state of repair as small cracks and missing mortar can expand when hot and leave a direct line of sight between thatch and flame. Hot ember projection does not require a chimney fire to catch the thatch alight although it is far more likely to happen when it does. Just like the name the name suggests it is possible for hot embers to exit through the chimney pot and fall back down onto the thatch. This is one of the reasons a taller chimney stack is required under section J of building regulations. According to the burgoynes model many thatch fire they investigate have chimneys which are too short. 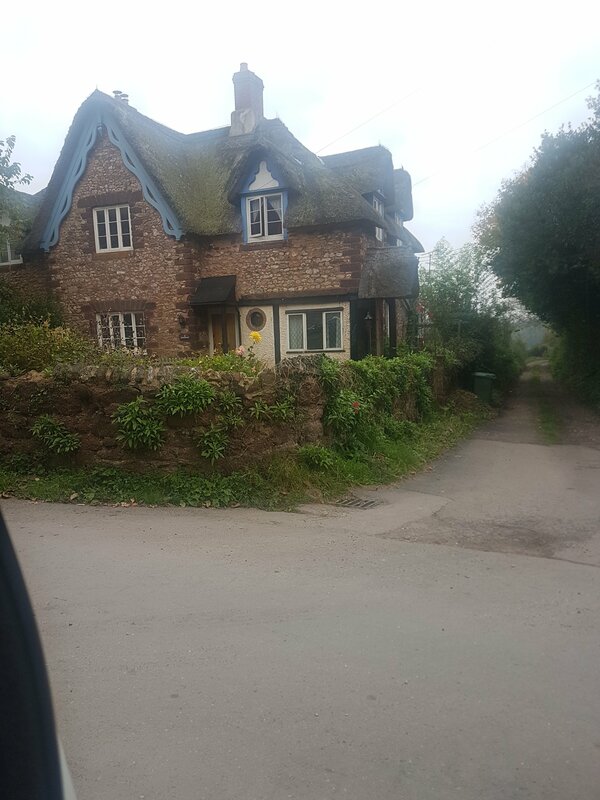 Due to the additional risk posed by owning a thatch propert made of wood and straw most insurance companies are very strict with the requirement to both sweep and camera survey thatched properties. 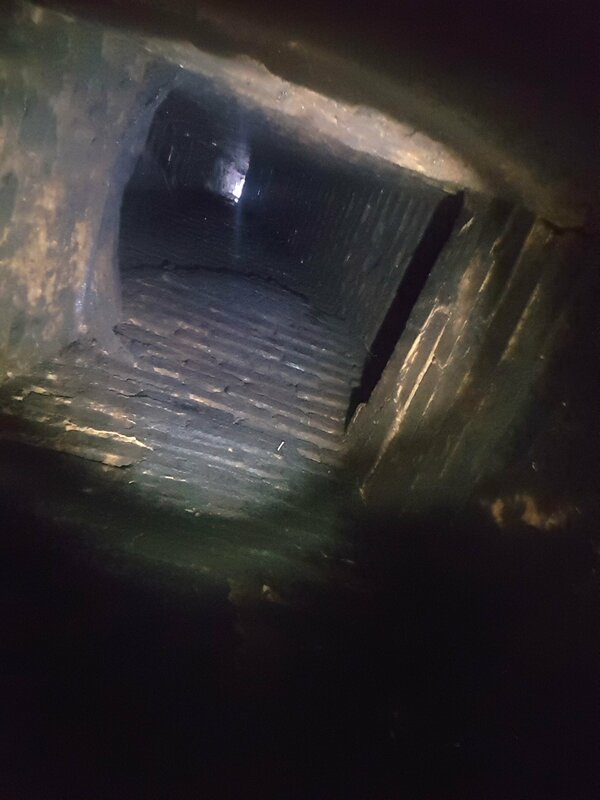 It is typical for a chimney to be swept by a professional chimney sweep registered by one of the HETAS approved associations once per season when in use and a camera survey performed once every 3 years. Chimney sweeping certificates must be kept by the sweep and the house owner. Chimney sweeps may require additional imsurance to sweep thatched properties. So what can the consumer do to minimize risks? Must have the chimney swept by a certified professional on a regular basis, ask to see their credentials as most sweeps are not trained to deal with thatched properties. Contact your insurance company and find out what your responsablities are. Have the chimney camera surveyed every 3rd year or as often as the insurance company requires. Treat the thatch with a fire retardent product. Dampen your roof on fireworks night and new years eve. Treat you chimney with creaway regularly to remove flammable creosote and tar. Do not slumber or over fire your appliance. Never use paper or accelerants to light your fire. Do not burn stoves with the door open unless they are designed to burn that way. Make sure your chimney is long enough. Undertake a fire assessment and thatch inspection on your property. The chimney sweep is responsible to be adequately qualified, equipped and insured to undertake the type of work they are doing and to keep records. They must be professional in their actions. Our company Hodgsons Chimney Sweeps offers expert and proffesional advise and service in this regard. The customer is responsible to employ a person competent enough to undertake their work, to comply with the requirements of their insurance company, to use their appliance within the manufactures guildelines. To only burn approved fuels, to utilise common sense where fire is concerned, to keep records of sweeping, surveying and installations. A customer must either use a HETAS registered installer or get installations signed off through local building control. Very few chimney sweeps are thatch experts. At the time of this article only the guild of master chimney sweeps run a course specifically for chimney sweeps who service thatched properties. Thatch is huge subject which i have only just touched upon in this article. I, myself am a former lecturer for the thatch course through the GOMCS, but i still consider myself a student everyday as i am always learning. Many of the thatch properties in the UK reside in the southwest. If you do require a thatch inspection please do not hesitate to contact us. I completely agree Ben, I believe there should be a Thatch approved appliance guide personally.